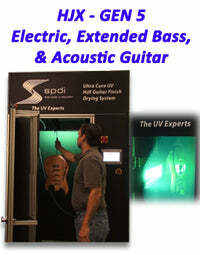 The Leader in UV Automated Guitar Finish Curing. 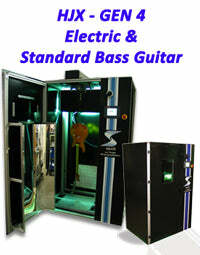 Full customizable digital profiling to meet every guitar design's unique needs for UV finish curing. The Touch Screen Control Center features advanced real-time monitoring, self-diagnostics, and customizable alert information. Incorporates user-friendly production history, maintenance reminders and tips, as well as expansive help screens with trouble-shooting guides and light bar production indicator. The design of the Total-Cure automation allows for complete cure over three dimensional parts. With product and part in full motion through automation this unit insures a complete uniform cure without creating damaging heat build up at any stage of the process. The CureUV/SPDI Fully Automated Curing Cabinet has multiple cycle modes to accommodate any configuration needed to cure your products quickly and safely and it is all done automatically. The coolest UV curing cabinet available, as it utilizes a single high power lamp that can safely and easily cure all product surfaces. There is no waiting for the lamp to power-up between curing cycles, due to the fact that once the lamp is on the system remains in a ready stand-by condition. Its rugged design and unique diversity allows for limitless product types and configurations. With selectable UV curing parameters on demand, this unit provides the cure for a variety of your finishing needs. "In my experience in the UV world everyone seems to complicate every thing about UV technology, throwing out big terms and chemistry that I don't really care about. The big question is, does it work or not? Talk is cheap. SPDI offered a machine that works. They are a creative company who doesn't hide behind big words and price tags to know what you want. I foresee a long future with SPDI and PRS guitars." "SPDI made UV a value to our company...listening to what we wanted and learning our process to make sure that we got what we needed...and most importantly the customer service after we received the UV system. Production, production, production...the faster we get guitars out, the better our cash flow became...it's really hard to turn a profit in this business, and UV technology is a MUST have to get on the path to getting your business in the black. As a very small company, financially it was difficult to have guitars hanging for a couple weeks while they finished curing. The sooner we could get a guitar shipped the sooner we get paid. "AT LAST !!!! UV technology available at your finger tips. I can't believe how fast, precise, productive and cool running this drying booth is. 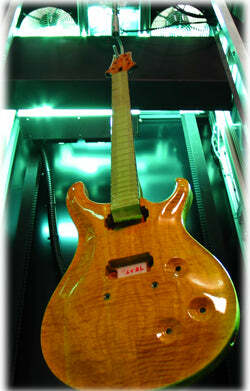 It takes more time to apply the finish over the instrument than what it takes to dry it. Seriously, making repairs on already finished instrument and finishing our own guitars is a breeze. We used to use a three part polyester system that was very dangerous to use plus we could only apply four coats a day and then leave it to dry overnight, scuff sand and repeat that same process over again for the next four days. With the Total Cure cabinet we can build up or fill the pore of the wood, apply the sealer, color coat (drying times depends on manufacturers) not UV, and apply topcoat only in a matter of hours, !! !YES, hours!!! Another cool advantage is you don't need to worry about plastics coming loose because of temperature, you can also program the intensity of the light hitting instrument. The easy programmable user friendly touch screen display permits to apply UV light where you want it, you don't need to suit up for this process, just insert the instrument in the cabinet, close the door, program and two minutes later its done. Even Popcorn takes longer to make"
Why buy your UV guitar finishing / refinishing UV dryers & UV coatings from cureUV.com? Cure UV provides expert UV technology experience along with thousands of UV products and various UV Finish, UV coatings & UV curing solutions. CureUV.com’s parent company, SPDI UV, has over 15 years of experience in satisfying the most demanding of industries. The finest UV products available in the world of UV guitar finishing & refinishing are furnished to companies such as PRS (Paul Reed Smith), Ernie Ball, Third World, Simpson Guitars, and Greenfield Guitars. With all of the attention on Green Technology, VOC removal and Eco-Friendly products (for good reason), cureUV.com is proud to be a major part of the contributing technology that furthers these interests. We feel that making our customers the number one priority by providing proven established UV products that aid in the this growth of Eco Green Awareness and provide UV solutions for various health issues is a rewarding contribution to today's society and tomorrows accomplishments for better Eco and personal health. When you find the UV guitar finishing or refinishing product you need, just click on the shopping cart icon to be taken to our online order center. If you can't find what you're looking for, please contact us and we will try to help (561) 243-8442. We welcome your feedback and suggestions. It makes us better at what we do and that's important to us.